Inspired by: I’ve always liked crispy chicken tenders/nuggets/strips, but wished there was a non-greasy version that had real chicken inside that was safe to eat. I thought it might be fun to use my blackening spice for this and try making them for a small party. 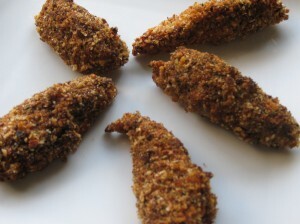 I love the crispiness, and the spice gives them an awesome kick! Notes: Because these are getting so much more surface area covered with spice than making blackened chicken with whole or half chicken breasts, these can get pretty spicy – so if you like spice, but not too much, I suggest using a bit less spice and a bit more of the bread crumbs. For parties, I have prepared these on the cookie sheet early in the day and kept them refridgerated and then took them out to bake when ready to serve. You can bring them to room temperature first, but it really isn’t necessary. Wine Suggestions: A medium bodied red with some good fruit and spice on it would be perfect. A Syrah or Southern Rhone blend, Zinfandel or a spicy older Barolo. Off dry whites are often a fantastic pairing for spicy foods such as a Riesling or Viognier/Condrieu. Time: 30-35 minutes active, 4.5 hours total. Approximately 20 minutes to prepare marinade, 4 hours for marinating and 10-12 minutes to grill. Inspired by: This is probably the most common Armenian marinade for chicken, beef and lamb. My family used this marinade for kabobs when I was growing up and would add green bell peppers, onions and tomatoes to the kabobs to make them yummy and beautiful. Mix all of the rest of the ingredients in a medium sized bowl and then add the chicken. Marinate in the refrigeratore for 4 hours. Skewer and grill at about 400 approximately 5-6 minutes each side – you should see grill marks – check to ensure it is cooked through – with metal skewers and fairly high heat – it will cook fast. Notes: This is great with any meal, but nice to incorporate into a mediterranean-themed meal such as hummus or baba ganoush as a starter, and served with armenian rice pilaf and greek salad. Wine Suggestions: This will go well with creamy, crisp or aeromatic white such as a California Chardonnay, White Burgundy or a Sauvignon Blanc from any region, or a light bodied red such as a Pinot Noir or Red Burgundy. I especially love this with a very lemony, high-acid White Burgundy. Time: 45 minutes active, 6 hours total. Approximately 20 minutes to make the marinade and cube chicken, 5-6 hours to marinate, and 25 minutes to skewer and cook. Inspired by: I’ve always loved a lot of Indian chicken dishes that use yogurt marinades to tenderize the chicken and various curies for fabulous flavors. I just started experimenting with various ingredients and have found that I like just about any similar combination. I took notes once so I could share this with friends. Mix all rest of the ingredients well (except lemon) in large bowl. Add the chicken to the mixture and marinate in the refrigerator for 5-6 hours. 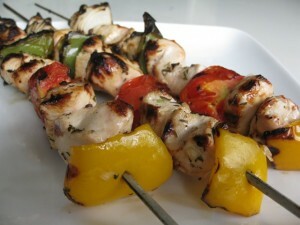 Put on skewers, and drizzle with fresh lemon juice about 20 minutes before cooking. Cook on grill at about 400 approximately 5-6 minutes each side – you should see grill marks – check to ensure it is cooked through – with metal skewers and fairly high heat – it will cook fast. Notes: This is even good warm or cold for a picnic with greek salad, and pita bread for sandwiches and yogurt dill sauce. It’s easy for dinner parties and super easy for larger parties as you can serve it as finger food with toothpics and the yogurt dill sauce for dipping. Wine Suggestions: Spicy, medium bodied reds and off-dry whites. 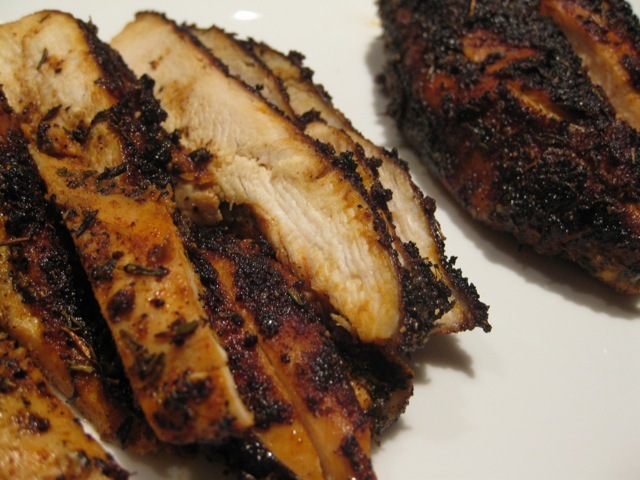 Inspired by: My love for spice and chicken that is cooked well, but still very juicy! I think this is one of the best ways to really sear in the juices and cook chicken fairly quickly. Heat your cast iron skillet so that it is searing hot (approximately 5 minutes). Pre-heat oven to 375-400 or if you have a good toaster oven you can use that and skip the pre-heat. Cut chicken breasts in half lengthwise if they are too large for a single serving. Coat the chicken in olive oil and roll it in the spice until it is completely covered. Add olive oil to the hot skillet, heat for about 30 seconds, and place the chicken breasts in the skillet. Sear each side for 3-5 minutes until blackened and crisp and juices are locked in. Remove from skillet and place in oven. Cook smaller breasts for approximately 15 minutes and larger ones for approximately 20. Notes: Slice into strips and server over salad. Wine Suggestions: A medium bodied red with some good fruit and a bit of spice on it would be perfect. We just had this last night with our friends Katie and Joe and drank a Southern Rhone blend – Chateau Pesquié Cotes du Ventoux Terrasses. It was fun because, coincidentally, they were at Chateau Pesquié last year. A spicier Rioja, Barolo or Zinfandel, or an off-dry white would be other great options. Inspired by: Yummy flavors of ginger-infused meals in so many Asian-style restaurants. I read about ten “ginger-chicken” recipes one day and then used the one I liked the most (by blogger Joey Randall – The Village Voice) because it seemed to be the healthiest. I may have modified it slightly. Combine soy sauce, ginger, garlic, rice vinegar, honey, sesame oil, red pepper flakes and cornstarch. Pour over chicken to marinate while prepping vegetables. Heat wok or large skillet. Pour in olive oil and heat. Remove chicken from marinade and carefully add to pan. Cook until tender – about 5 minutes. Pour marinade over chicken. Add the veggies. Cook 3 minutes or until sauce slightly thickens, stirring often. Remove from heat. Add almonds. Spoon 1/4 to 1/2 cup chicken mixture into lettuce leaf and roll up. 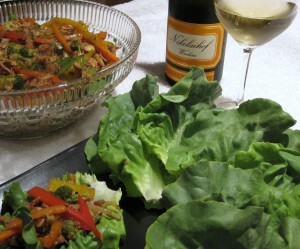 Wine Suggestions: An aromatic white that is slightly off-dry will work well with the ginger and spice of this dish. We drank a dry, 2006 Nikolaihof Grüner Veltliner and while it’s one of my favorite Grüners with beautiful aeromatics, I think a fruiter or slightly-off dry wine would have been a better pairing. Here are a few suggestions starting with off-dry and ending with dry.